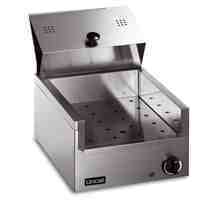 Maintain that 'fresh from the fryer' taste and texture with the LYNX 400 Chip Scuttle. It will hold chips and other fried products at prefect serving temperature and condition for up to 20 minutes. The perforated drain plate helps to keep chips deliciously crisp as well as providing easy access. It's removable too, as is the interior, which makes cleaning so much easier. The lid, with its positive 'park' position, is designed for safe, easy use. All in all, an essential item of equipment for the busy kitchen.